Earlier this week, Dale Earnhardt Jr. announced that 2017 is his final season as a Cup driver. I am not happy about this, as he is my all-time favorite driver. The sport has lost several big names to retirement in the past couple of years, and none of these retirements make me happy, of course, but when it's my favorite driver? Not cool at all. I've been a fan of Dale Jr. since 1994 and unlike most I was not a bandwagoner who just became a fan of his because of his father- truth be told, I actually rooted against his father when he was alive, but once we lost him, I realized that the races weren't as fun without him and I actually became a fan retroactively. 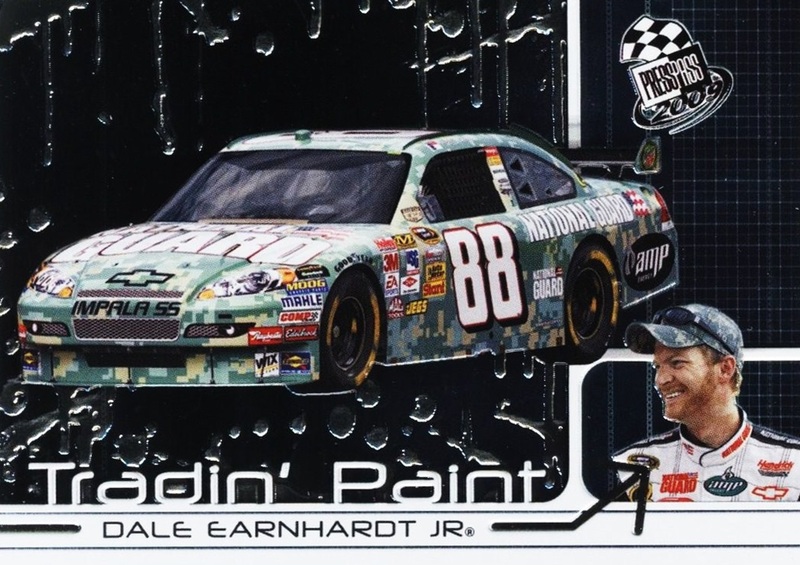 Since Dale Jr. was sponsored by Budweiser for the first half of his Cup career, none of his cars from 1999-2007 are shown properly on cards- they are all censored. In 2008, he joined Hendrick Motorsports, and finally his car could be shown properly. Unfortunately, by this time, Press Pass was the only option and they never really figured out that a NASCAR card set should show cars. But every so often one would find it's way onto a card, and today we have one of those. The card is foilboard so it doesn't scan well. Almost all of Press Pass's inserts post-2005 were mirror foil. The first several years with Hendrick saw National Guard on board as sponsor for half the season, and they had a signed contract for 2015 and I believe 2016 as well but didn't follow through. The cars were normally blue and white but for the July Daytona race many teams usually bring out a special paint scheme, and for that first year with Hendrick the car went all-camo. Dale started third, led a race-high 51 laps, but ended up finishing 8th. Daytona and Talladega can be unpredictable and you need to have not only everything go right, you need drafting help from other drivers to be able to win. Three of the seven cars that finished higher also carried a special paint scheme for that race, including race winner Kyle Busch. It was the only time this camo car ever took the track. Man, nothing can top the Perlorian Cats. But I still have some 90s greatness to share anyway. I have been an Olympic fan for a long time. The first one I remember is the 1992 Barcelona games, but my family remembers that I watched the 1988 Seoul games as well. But the first one I was really a superfan of? That's 1996. It was the second one where the basketball games had truly the best players in the world. 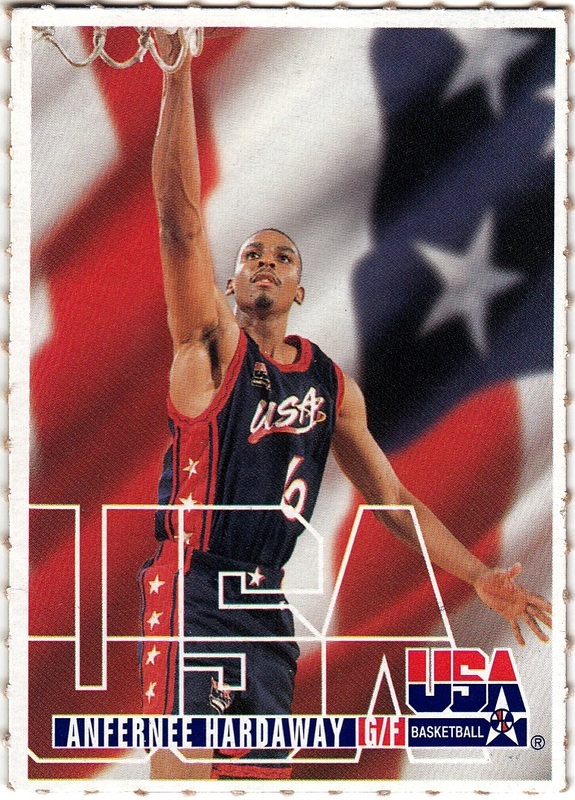 I had discovered the NBA earlier in 1996 so naturally I was a huge supporter of the 1996 Olympic basketball team. Sad thing is, I have no memories of the 1996 basketball tournament. I know I watched it. I've watched it in every Olympics. I just don't remember it. I don't remember most of the Olympic basketball, and I wonder if that is because I watch so much basketball that it all kinds of blurs together, where the other sports I only see with the Olympics, so it stands out more? I don't know. But I have chosen a card set related to the 1996 US Olympic basketball team. These cards were on the back of Kraft products- I think the crackers with the red stick and odd consistency but still tasty cheese, but I'm not sure...that was a long time ago now. It's a perfect combination of three of my favorite things- NBA, Olympics, and Cheese. I have 5 of the cards, wish I had the rest. I'm actually amazed I got as many as I did, considering they were actually issued in 1995...The scanner I was using at the time didn't handle the cards well, but believe me, they don't have that crosshatching pattern on the actual card. Another set that will have be be rescanned some day. This one may be my favorite oddball set ever. 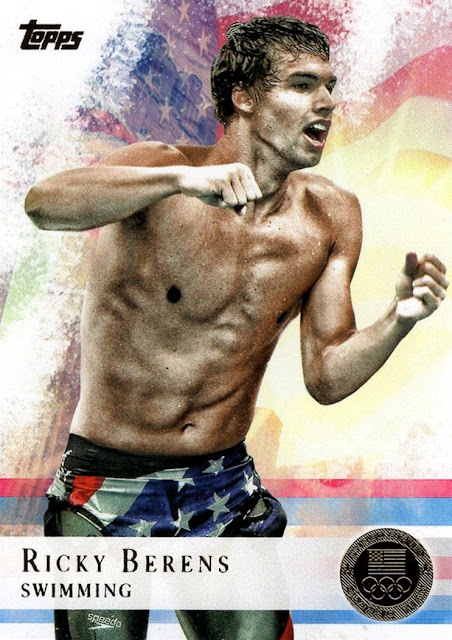 And while it's an issue from Topps, well...there's no other way to consider this than as an oddball. While I have more 70s oddballs, there was really no choice as to my favorite- this is one of the few on the Challenge list that I didn't have to think about, I already knew the answer going in. 1971 STP was the very first NASCAR card set ever. These standard size cards were issued by the STP corporation and from what I have been able to gather were handed out by the drivers...that might not be correct. Beckett lists these as a 1972 set but they are not, they are 1971. 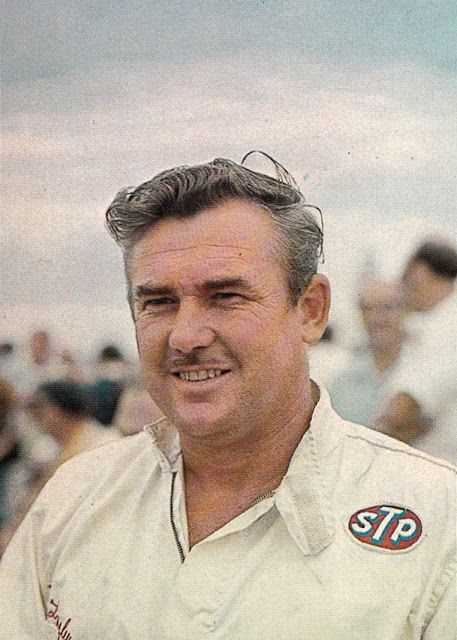 1971 was STP's first season in NASCAR, they sponsored Fred Lorenzen that year. In 1972 they moved to Richard Petty, they would stay with Petty until 2000. 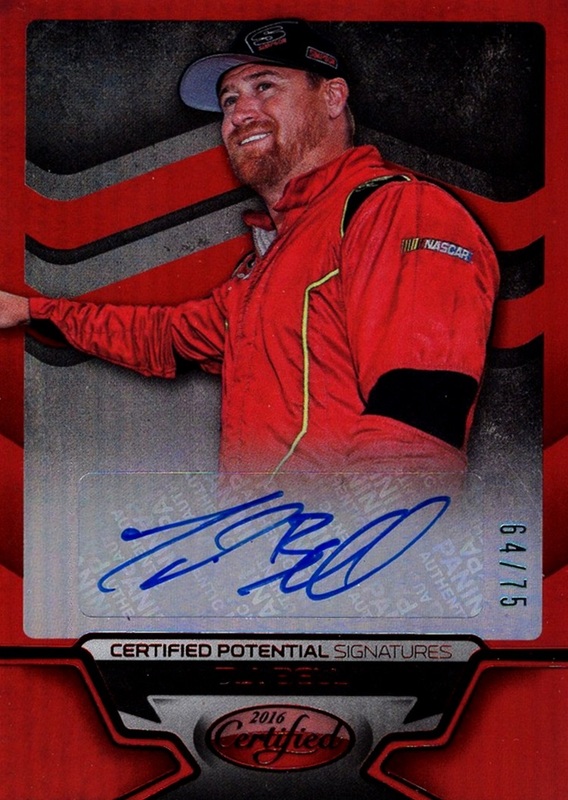 The set, however, includes two cards for Lorenzen and only one for Petty, which does not mention any connection to the STP corporation. It does, however, mention his results for the 1970 season, as does this Elmo Langley card shown. They must be from 1971. They are very rare- this Elmo Langley card is the only one I have, and I've shown it before. I'd love to get my hands on the rest, but when they pop up they usually go for about $200...I can't do that for a single card. I can't even do that for a box of cards. This Elmo card was Buy It Now on Ebay for $20 in 2015. That was one of those rare times where I didn't mind spending $20 on a single card. I actually worried that the seller had left off the second 0 and wouldn't ship it, but he did...I ended up getting a bunch of great 90s oddballs from him right after that, all at good prices. The box arrived 4 years to the day after I collapsed and came literally 5 minutes away from dying. What a difference 4 years makes! Thank you my friend, I very much appreciate this! I don't actually have many 60s oddballs. Again, like the 50s, it's from before I was born so I don't really know what is out there, so I basically only have whatever I've stumbled across. This one is a set I was aware of and looked for. From 1961-62, it's the Essex Meats St. Louis Hawks set. This regional issue was made by the Essex Meats company. The cards are not numbered and include several players who got their only card in this set. McCarthy is not one of them, though, he also appears in 1961-62 Fleer. This is the only card I've been able to get my hands on- some of them can sell into the triple digits so I don't expect to ever be able to complete this set. I love oddballs. I don't know any collector that doesn't. I don't have many 50s oddballs in my collection...mostly due to lack of access. I can't collect what I have no idea exists. but mostly they are just fun. Unless you are a communist, in which case it was implied you'd be on the business end of the missile. This is an interesting one, because I'm not sure how it was really meant. I'll post it as I see it. In 2013-14 I was buying a lot of cards at retail. My second year back into the NBA, I was collecting heavily at that time- more than I am now in fact. Panini makes very small sets. Most are 200 cards. It's not hard to get at least one card of a person if they are one of the "chosen ones" Panini puts into sets. (With a 450 man league, Panini usually ignores more than half of it). With the way Panini does things, there are a core group of rookies that they put in every set, and then some other rookies who show up in some sets. 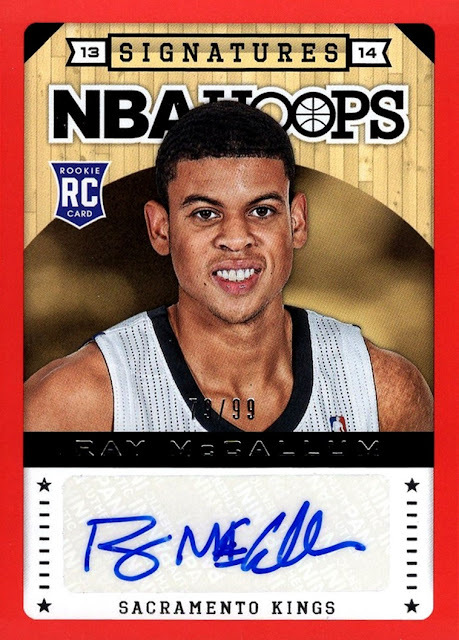 Ray McCallum was one of the original group of rookies who was in every set. Despite my opening a ton of packs that year, I did not get a single McCallum card. He was the only main rookie of the season I did not add to my collection during that season. Eventually, I've gotten a couple of cards of him. Not many, but he has been rare to see in a set post-rookie season. In a bit of a humorous twist, I recently found a pack of 2013-14 Hoops that I had gotten in a blaster when the set was new, but I had misplaced it. I opened it up and what do I find? If I had not lost this pack, not only would I have had a card of him during his rookie season...it would have been an autograph. Funny how that works some times. The original topic was "a rookie you thought you were investing in". I don't invest. Investors are the enemy of true collectors. Investors don't care about what it is they are buying, as long as they can make a profit. They keep things from being in the hands of people who actually care about whatever it is they are buying, and they artificially inflate prices in a manipulation made only to make themselves feel better. What I will do. however, is showcase a player that I thought was going to "make it" in the NBA, but instead never played a single game. Rod Grizzard was highly touted coming up through college, he was somebody I heard a lot about as a can't miss prospect. He ended up slipping to the second round of the NBA draft, and was cut during preseason. He never played a single NBA game. He did have a professional career- in Singapore, Belgium, Australia, Israel and New Zealand. And for the USBL, which is an American league but so far off the radar they have never gotten any cards. Spent some time in the D-League too. His last year playing professional ball was 2011. I have absolutely no idea what he's doing now. I'm heading to Wayne, New Jersey for the largest scale model car show in the world. While I will have internet access I will probably be too busy to post so the posts for Friday, Saturday and Sunday are being scheduled. By now I am well into the month of April without missing a day and I am hoping to keep that streak going. When I return I should finally have time to type up the three box breaks I've done since I started the 30 Day Challenge, but the Challenge is what you will be seeing for the next few days at least. My favorite parallel concept is a long-running one. My all-time favorite is the Refractor concept. Introduced by Topps in 1993-94, they are incredible. I've never met a Refractor I didn't like. Picking one to show here is a tough choice, because I have Refractors in my collection spanning about 20 years. So, when all else fails, I will show one of the oldest. Refractors just look like they are glowing from the inside, they look great. The first set that had them, 1993-94 Finest, is some of the rarer ones. I only have 5 of the 220. I just got the base card in trade last year, I wish I had scanned it so I could show what it looks like as well. Here's a base card of one of his teammates. Unfortunately some of the early Finest cards, the skin color of the player is turning whitish or greenish, with no real rhyme or reason for it to do so. At least this one is uniform. Not all are. There's quite a few basketball cards in my collection from outside the USA, but I've shown a whole lot of basketball in this program. Let's expand the field a little, and go back to long before the first basketball card was ever issued. As I've mentioned in the past, ancient history is one of my absolute favorite things to read about. There are very, very few cards that cover ancient history, and this is one of a very few in my collection. 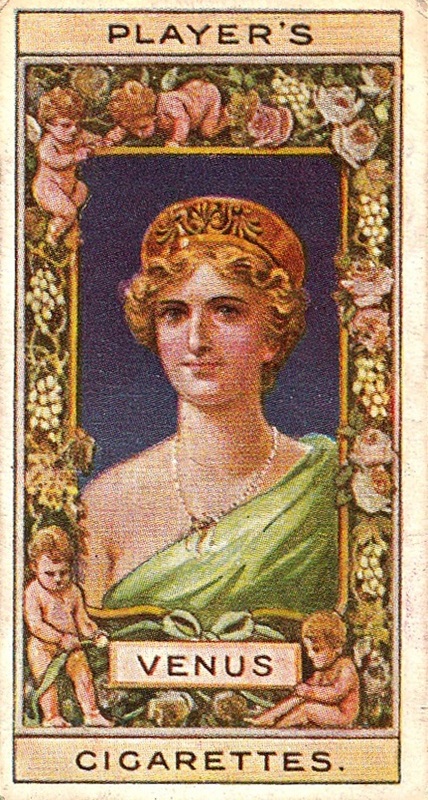 Hailing from 1912, this card is from the Player Egyptian Kings, Queens and Classical Deities set. It's my only card from the set, and I won it on ebay a couple years ago. It's not the first time I've shown this card on Cardboard History. At some point I'd like to get the rest of the cards in the set. I seriously considered one of the cards from the 1908 Wills European Royalty set, but with 55 of them, I would have a tough time choosing. The original challenge used the term manager, but in the NBA we have coaches. I don't know enough about hockey history yet to know which coaches are former players. My favorite team is, of course, the Nets, and they have had former players as coaches on several occasions. 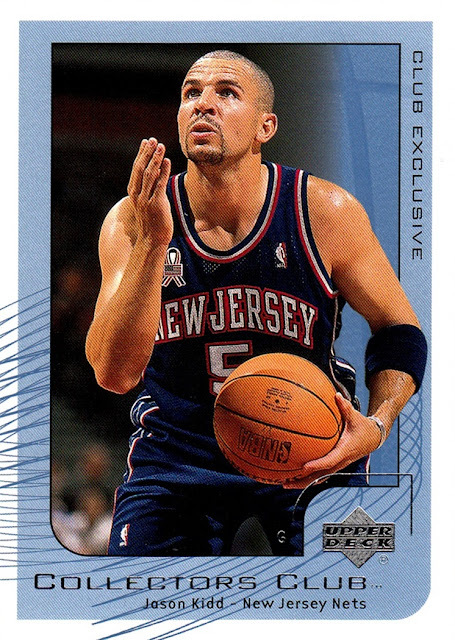 The Nets actually had their all-time best player come back and coach, so today we see Jason Kidd. He played for the Nets from 2001-02 (when this card was issued) through 2007-08, and he coached the Nets in 2013-14. He is currently coach of the Milwaukee Bucks. He does have a Nets coaching card, but it's an autograph and I don't have it. I've never even seen a scan of it. This is yet another tough one for me, because I can't really remember which set was the first one I put together by hand. This is similar to post #3 but I took that one to be a set I tried and failed to finish, and this one to be a set I tried and succeeded on. Or at the very least a set I didn't cheat and buy a complete set of. Most of my early set completions were sets that I bought, either as a factory set or as a set built by somebody else, or that I got as a gift from my family. I think the first one that I actually finished the hard way- card by card, from packs- was 1997-98 Z-Force. I don't know when I exactly completed it but I was done with it by Christmas 1998. When I was doing it it seemed like a bit of a challenge, but I guess time passes differently when you are young. I know I actually completed series 1 twice over but I never completed a second copy of series 2. I was hoping to be able to trade them for something really good if I ever did, but I didn't. I'm not sure where my spare copy is now, but I know it's around somewhere. 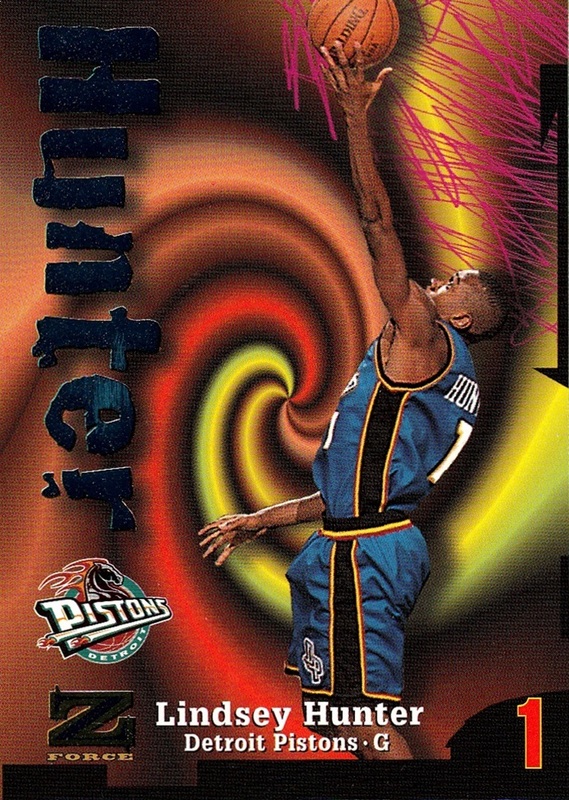 Here's just a random card, #96, Lindsey Hunter. This was a set I loved when it was new but not so much anymore. The cross-hatching pattern you see is my scanner not being able to properly scan the card. The name and Z are foil. Another tough one. I like most people in sports. And the few I don't like, I don't appreciate either. If they have done something to get on my "dislike" list they have to have done something pretty bad. I don't randomly hate people because they were drafted by a team that isn't randomly in a geographical area in proximity to mine...I'm far too smart for that. If I had the one and only card of John Calipari from his time with the Nets I would show that here, but it's not in my collection. Oh wait, I couldn't show it anyway because it has to be somebody I respect, but don't like. 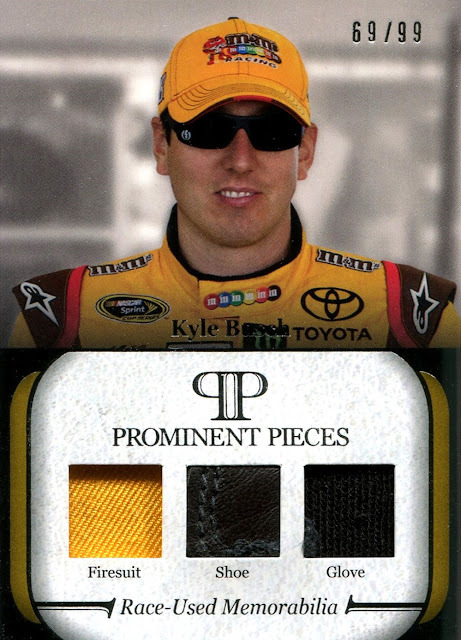 So I think I will have to go with Kyle Busch. Why I respect him: He's a good father. He's one of the most talented drivers I've ever seen. He can do things with a race car most people wouldn't even try, let alone be able to accomplish. If he had a better personality, I'd be a big fan. 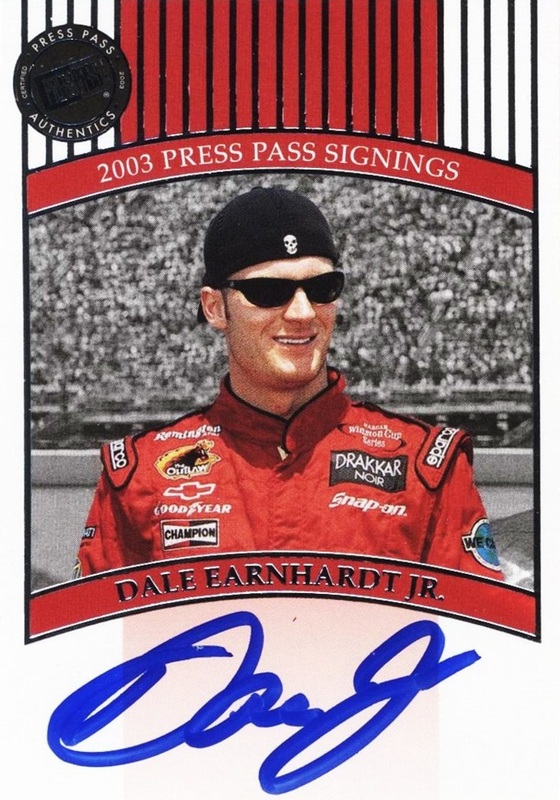 I was a fan, a long time ago- back around 2000-2001, NASCAR literally made a rule to keep him out of the Truck series because he was so much better than everyone else- and he was only 15 at the time. He's a year younger than I am. I have long suspected that part of his "bad boy persona" may be something NASCAR is pressuring him to do. Once Dale Earnhardt Sr. was killed NASCAR didn't have anyone to be the "bad guy" and it seems to me like they may have pushed Busch to act that way. I sort of hope that's the case, but if it is, it's a pretty low thing for NASCAR to do. Just a couple of interviews he's done, a few things he's said, lead me to believe that. I don't hate Kyle Busch, and he's not my least favorite driver in the sport- there are a couple I neither like nor respect- but I don't celebrate when he wins either. Our current decade, while still in progress, I don't think will be looked back on with great fondness. Too many exclusive licenses, too many manipulated photos, too many small sets, too many players ignored by card companies. However, the peripheral world of the hobby has certainly changed. Now, you have websites like the Trading Card Database, COMC, and the concept of card blogging, which to me all date to this decade. I know the Database is actually from the last decade, but I only discovered it in this one. I'm not sure when COMC was launched, and I have no idea when card blogging started. I don't know what the first card blog even was. I know I discovered them in either 2013 or early 2014, through the Database's blogroll. I began reading some, and I enjoyed it. I decided to start my own and in November 2014 Cardboard History was born. It's easier than ever before to get a card you want show up right in your mailbox, and while it's true that the concept also dates to the previous decade- maybe even the late 1990s- it was really perfected in the Teens. Yeah, I still think of the 19teens when I wrote that as well. Now, it's hard to tell how this decade will be viewed in the future because we are still in it- things we love now because they are new might not be something we look back on fondly (as an example, I loved 2002-03 Fleer Box Score when it was new, and now I'm just kind of "meh" on it) and things we may overlook now might be viewed with great nostalgia in the future. But for me, the 2010s is going to be remembered as the decade I discovered the NHL. I was aware of what it was in the 1990s, but I didn't become a fan until 2016. In that time, it's become something I can't live without. It's already surpassed NASCAR as my #2 favorite sport. It went from something that I knew existed, but didn't really affect me, to becoming something that's an integral part of every single day of my life practically over night. I've also spent the entire decade working on scanning my card collection. I began the process in 2009, but I've been working on extensively this entire decade, and I still have enough cards ahead of me that I don't expect to finish this decade either. It's going to be when the majority of my collection was scanned, and that's something that is pretty important to me. However, with that said, I'm going to show a non-sport card today instead. 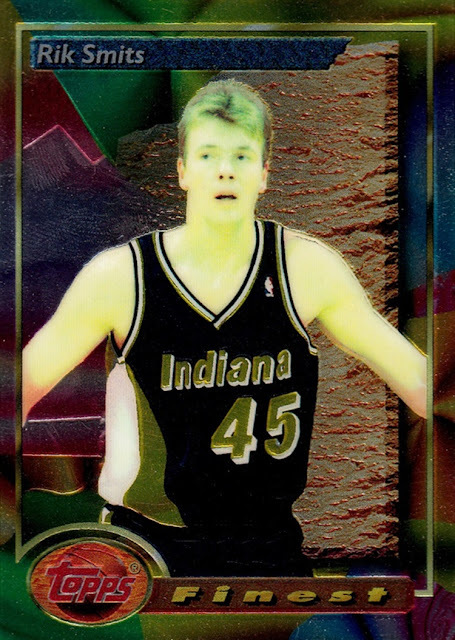 You'd think I would show a hockey card, or an NBA card- I did get back into the NBA in 2012, righting a wrong I inflicted on myself in 2006, but I'm not. You may remember what I wrote about ships earlier in this 30 day challenge. Well, a piece of one of those wonderful ships outshines any sports card to me. How anyone could not love this ship is beyond me. It's a thing of complicated beauty to me. And to have a piece of wood off it's deck? That's so amazing it's almost unbelievable! It says on the back that this wood was removed off the ship during it's 1972 replanking. This is basically something that would have been considered waste..but I consider it one of the greatest cards in my collection. I pulled it from a box of 2009 Topps Heritage Heroes Edition in 2012, and I consider it not only the best non-sports pull of my entire life, but in the top 5 all-time. It is my favorite non-sports card in my collection. 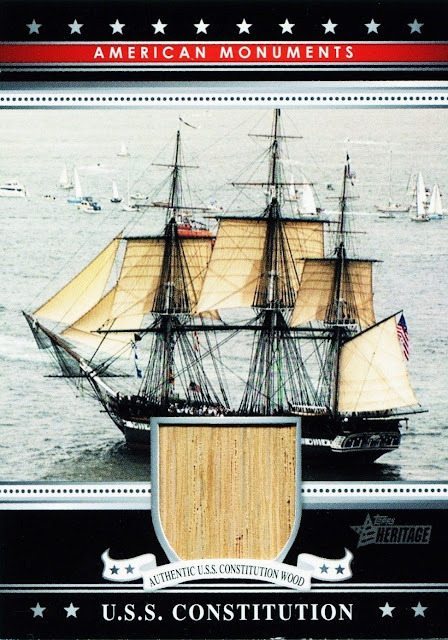 I do wish they hadn't cropped it so tightly though, and more of the actual ship was visible on the card, but I'll take what I can get. This is a tough one as well. The 2000s are a bit of a let down compared to the greatness of the 1990s. When I am going through my cards, the majority of them are actually from this decade, but it's the 1990s that I really enjoy the most. In fact, I became so disenchanted with the cards that I left the NBA in late 2006...although now, looking back, I consider it one of if not the worst mistakes I've ever made in my life. There were some good things in the 2000s- don't get me wrong- but it is no 1990s. It was also when I was farthest away from the hobby. 2007 and 2008 were my worst years in the hobby- 2008 in particular. I only got 14 documented new cards during the entire YEAR, and 13 of them were the bonus set that came with the NASCAR yearbook, always a Christmas present from my mom. 2009 was my card renaissance, and it's when I came back to the hobby full time, it's also when I got back into non-sports for the first time since roughly 1997. But again, I have to go with a NASCAR card, one of my greatest pulls ever. I pulled this card, of my all-time favorite driver, from a single pack purchase from the Target in Kingston, NY, in late 2003. 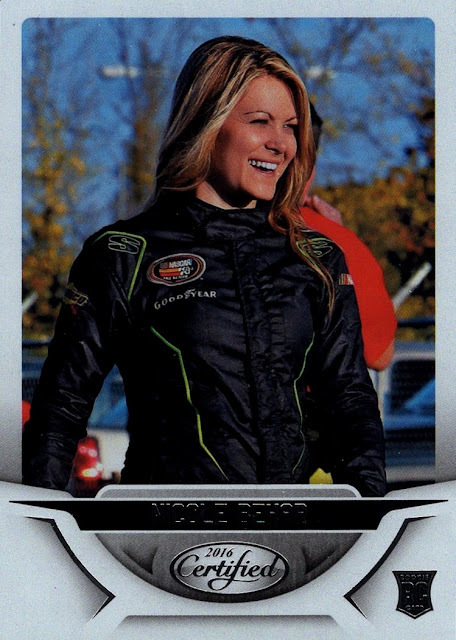 Since about 1998 I had not really done much NASCAR cards- I'd get maybe a pack of each set, maybe none at all. Until I pulled this one. This single card drew me back into collecting what was my favorite sport at that time on a full time basis. I've never left the sport since then. Pulling this one is one of the more important "touchstones" of the hobby for me. I'll talk about that more in 2018 as I celebrate my 30th year in the hobby. NASCAR may have dropped down to 3rd place now behind the NBA and NHL (already), but Dale Jr. is still my all-time favorite driver, and probably always will be. Although I post more about Elton Brand, if I were to make a list of my favorite athletes from all sports combined- something I don't think I'll ever do- they would be tied at #1. 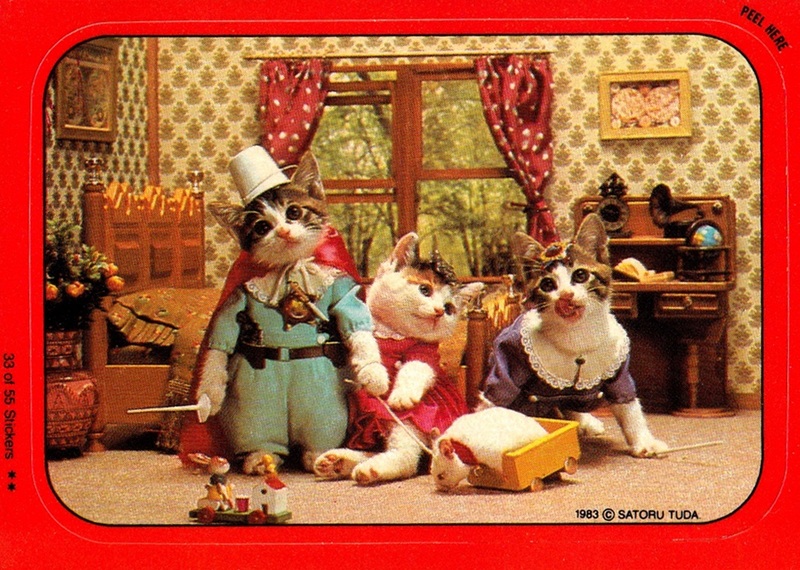 The 1990s cards are the best. It was truly the best decade, with the best designs, the best set composition, the best time to be a collector with cards everywhere. It's got so many sets I love that I could show a thousand cards in this post and not run out of favorites. But...the challenge is to show ONE favorite card of the decade. I knew it would be a card from either 1994 Action Packed or 1996-97 Ultra. In the end I went with Action Packed because for me the 90s were more about NASCAR than the NBA, although by the end of the decade card wise the NBA had pushed NASCAR by the wayside. Is there anything more 1990s than this? The dark squares are gold foil, by the way. Normally, I hate cards where it's just a photo of the person in front of a digitally generated backdrop, but this card has so much sentimental value that it overpowers that. 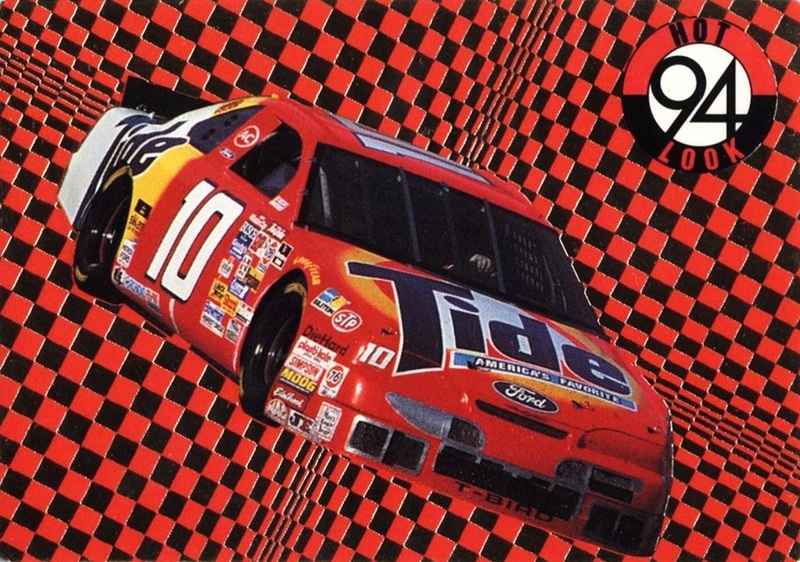 1994 was my second year collecting NASCAR (started the day after Christmas 1992, but I consider 1993 my first year) and the 1994 season cards are my favorite in NASCAR history. And none top Action Packed. It's bright colorful design, the ample use of gold foil, the embossing on every card...to 10 year old me this was the greatest thing ever. To 32 year old me, the sentiment is the same. Sometime during 1993, I saw Ricky Rudd's showcar, which was the first time I had ever seen a NASCAR race car in person. No pictures, but I remember where it was. I'll never forget it. Now we get into the really tough stuff. The 80s and especially 1990s are in my opinion, the best decades this hobby has ever seen. (except non-sports, which peaked before WWII). I was born in the 80s, I began collecting in the 1980s. Not as great as the 90s, but there are some very memorable sets from this time period. You have my gateway to vintage NBA cards (1981-82 Topps), the entire Star brand, the rebirth of Fleer, and the birth of Hoops- one of the only sets that's ever gotten it truly right. NASCAR starts getting cards on a regular basis in 1988, comic book based cards became a real thing instead of a rarity, plus throw in the Empire Strikes Back and Return of the Jedi sets of 1980 and 1983, respectively. 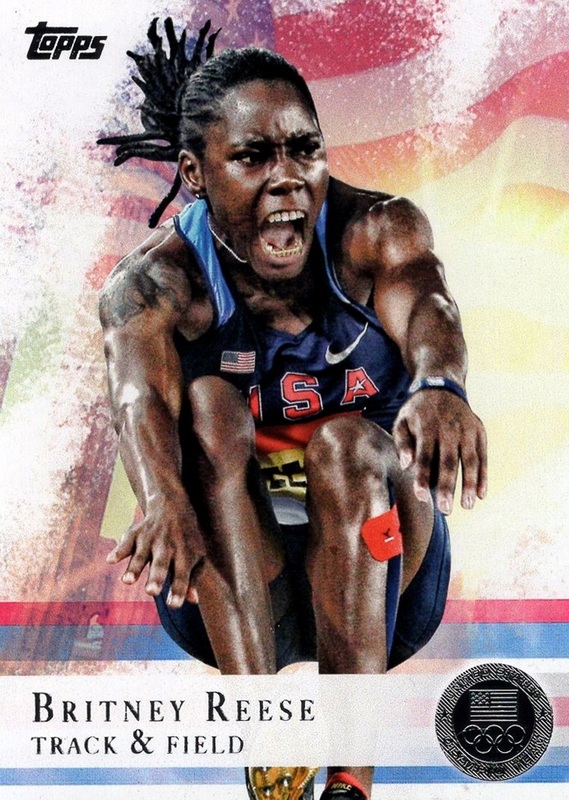 The first mainstream Olympic card set dates to the 1980s as well. There are so many good choices and picking a favorite was not easy, in fact I would go so far as to say that the 1980s were tougher for me to pick than the 1990s will be- the real question there is do I pick a card from my favorite NBA set or NASCAR set? I'll be doing that as soon as I save my draft for this post, so I'll know pretty soon. My readers will have to wait 24 hours (give or take) to find out. I seriously thought about going with a Star Wars card here...even though I am pretty down on Star Wars right now. I hate what Disney's done to it, and 2016 was the first year in my life where I did not watch any Star Wars movies. 2017 will likely join it. Still, I love the battle of Hoth and if I had a card that showed it, you'd probably be seeing it here. But I don't. I don't remember if they didn't show it on a card, or if I just either don't have it or didn't scan it. Either way, my favorite part of the Star Wars franchise does not appear on a card from the 80s in my collection, so you get NBA instead. Shocker, right? 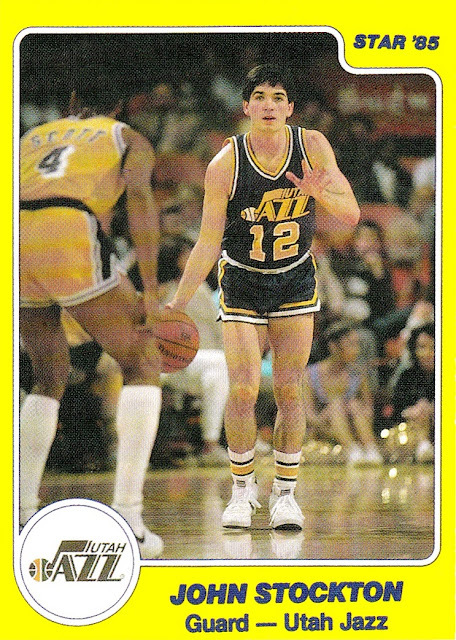 This is one of the key cards in my collection, John Stockton's rookie card. His true rookie card, from his rookie season, not the 1988-89 card Beckett says it is. The Star company had the NBA exclusive license from 1983-84 through 1985-86, and all three sets used the exact same design, just changing the colors for each team and the year listed. (Which I've always been annoyed by, because the NBA should NEVER have just one year listed. It's just outright wrong.) 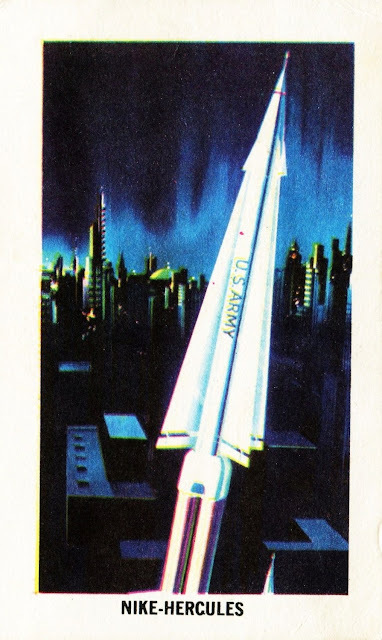 But it does not detract from the greatness of Star cards. In the 1990s I was a huge fan of the Stockton-Malone era Jazz. Their two runs to the finals, both losses to the Bulls, were so impactful that I still sort of root against the Bulls franchise to this day- despite the fact that nobody on those teams that took down the Jazz has been with the Bulls since the 1999-00 season. The only problem with Star is that they are hard to come by, and can be very expensive when you do. The 1984-85 set has some of the biggest names in NBA history making their card debut- besides John Stockton, you have Charles Barkley, Hakeem Olajuwon and somebody you may have heard of by the name of Jordan. Not to mention the established superstars like Magic, Bird, Drexler, Wilkins, etc. 1984-85's rookie class is one of if not the greatest rookie classes in history, and they all got their rookie cards in 1984-85 Star. I'll never be able to get most of them, but for my birthday or Christmas one year my mom got me the Jazz team set, which includes Stockton's RC as you see above. I'm still kind of shocked all these years later. It's a card I wanted but never imagined I'd ever get. I am a cheapskate, after all. Any day a new Star card can be added to the collection is a day to celebrate. I prefer to get them in team bags but if I come across a single I'll usually pick it up anyway. 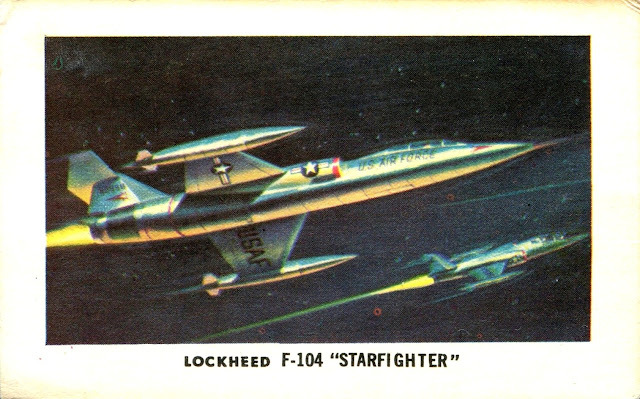 Star cards, by nature, are rare enough that I know if I don't get it then, I may never get it at all. It'd be far better to have a duplicate to trade if I pick up a single and then later get the team bag, but it's never happened. Sorry for the crappy scan. The scanner I was using at that time didn't handle the Star card fronts very well. At some point I'll rescan it, but I don't know when that will be. I actually had chosen a different card to post, but then I got to looking at the list of topics, and I realized that the NHL was not likely to make the project...but I was not totally convinced of my favorite 70s card that I had chosen from the NBA. I mostly chose it because it was a favorite set, not that I had any particular attachment to that card. I also couldn't find the card I really wanted to post...most of my 1970s cards are not scanned yet so I probably have not gotten to it yet. (I set aside all cards already done on the Database- unless I need them for a blog post- and the 70s are already done on there). So I got to thinking, now would be a good time to post some hockey! I'm still very new to collecting hockey. I only started watching regularly in November 2016 and collecting actively in January 2017. I've already gotten back to the 1957-58 season on pure dumb luck of being in the right place at the right time, which is how I've gotten about half of my collection of everything, in all actuality. 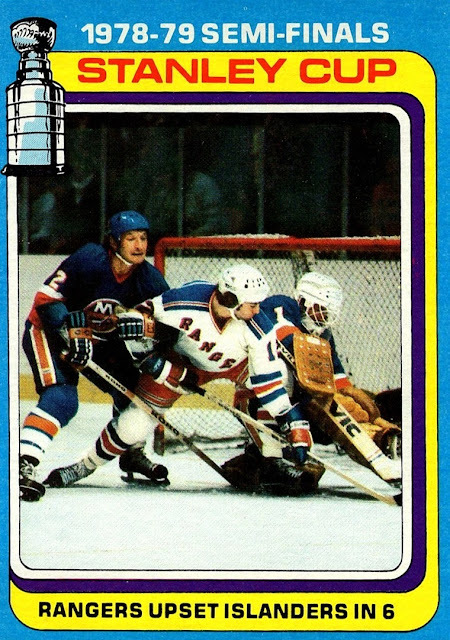 This was the first 70s hockey card I bought for myself, and it's the only season I've already imprinted in my brain that I don't need to look up which season is which- the blue border set is 1979-80. I already know that. The other years, because I don't know them very well, I have to turn over and read the backs as I have not memorized the design to the year yet. I'm sure I will, as I get more of them. But the blue bordered set is already one I know the year without having a second thought. It's also the 70s set that I have the most of already. I bought myself two of them, Shane from Shoebox Legends sent me 5 and Robert from 30 a week Habit sent me one as well. I know realistically I'll never complete this set with the Wayne Gretzky rookie card, but I will have fun chasing them for the rest of my life. I had mentioned at one point that I hadn't picked a favorite team and the Rangers or Islanders being "local" would not necessarily give them an edge...but the Rangers have become my favorite team anyway. I realized I was disappointed when they lost, where when I watch most games, I'm just happy to see some good hockey and don't really care who wins. I'm sure when I've been watching for a while I'll have a bit of hierarchy of which teams I like better than others, and which teams I actively want to lose games, like I have done over the years with the NBA. But I'm not at that point yet with the NHL. (And, to be honest, I still watch the teams I want to lose in the NBA because I love the sport so much I will watch every team, every time). I mostly collect cards because I enjoy the aspect of documenting history they do, or at least they used to do. There's not much of that in today's cards which is disappointing but that's a whole other topic. The fact that this one shows the results of a playoff series is why I chose it out of the binder my local dealer has. This really does document the previous season, even more than just a single player card does, which document's that person's previous season. I'm a big fan of cards of events, be they playoff series, league leaders, memorable moments, etc. 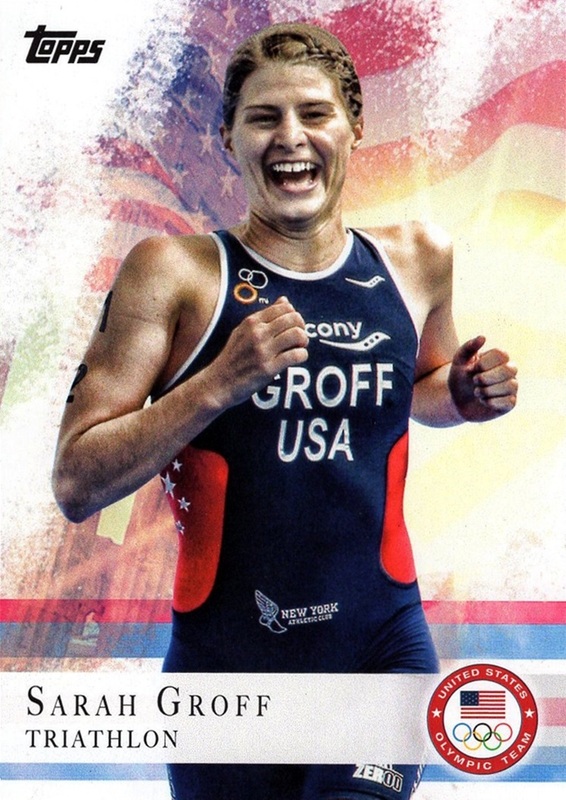 Cards should be more than just a photo of a superstar, they should tell a story of the sport. 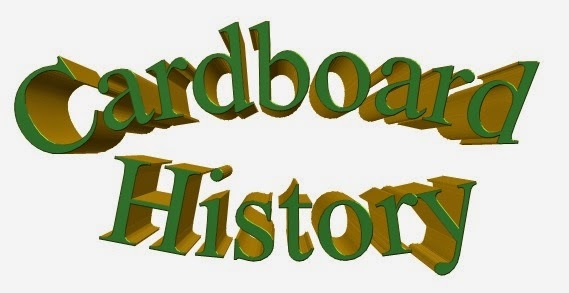 I didn't name this place Cardboard Superstars, I named it Cardboard History for a reason. An addendum to what I originally wrote: As I post this, I am watching my first playoff game in my NHL life. Rangers at Canadiens. I'm really hoping to see a Rangers win tonight! My favorite 60s card is actually from a set I've surprisingly never shown on the blog before. In 1961, Milton Bradley issued a 4-part series of postcard sized trading cards, called American Heritage Picture and History Cards. 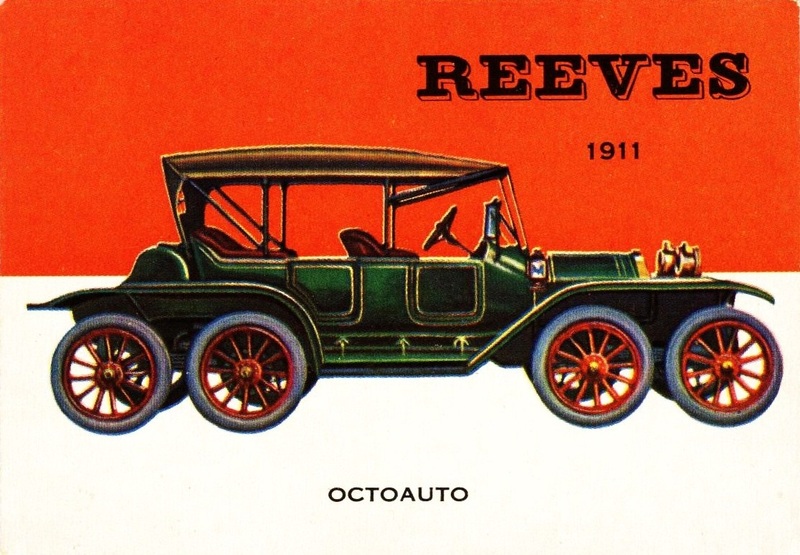 They did a set for Steamboats, which today's example comes from, Automobiles, planes, and trains. I have the complete boxed set for the Steamboats and automobiles but the trains and planes have eluded me. They are not common by any means. When they do show up they are not very expensive, it's just that they don't show up very often. This reminds me that I need to check Ebay again to see if I can add the other two sets....both sets I have cost me less than $20 each from Ebay. For some reason, the old time ships create an odd feeling in me. It's like a yearning, a sense of passion and pain, almost, an ache of something missing. It's hard to explain. I'm not sure why, because, to be honest...I've never been on a boat ride. Not a small pleasure craft, cruiser, or even my favorite boat of all time, Lake George's Mini-Ha-Ha, which offers 1 hour cruises on Lake George. It should not create these feelings in me, but it does. Even just reading the backs of these cards makes a tingle go up my spine and down my arms. It really makes no sense, I can't explain it. 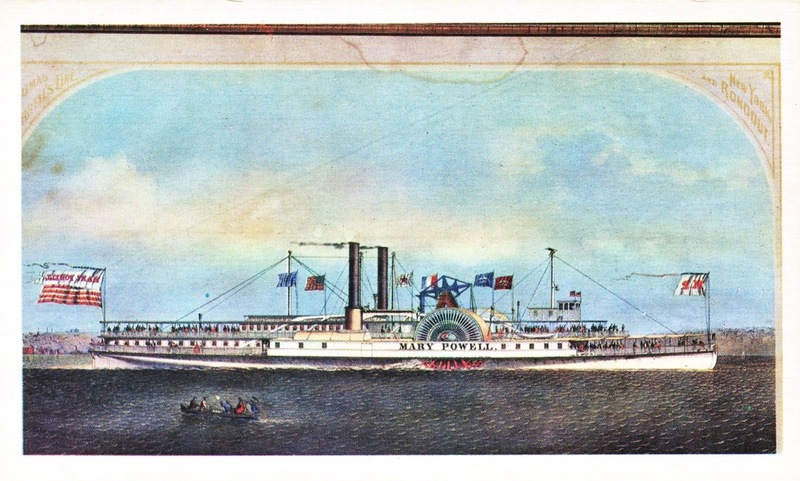 The Mary Powell, here, is a very local ship. She was launched in 1861 and was known as "Queen of the Hudson". She was originally a private ship but also served as part of the Hudson River Day Line from time to time. She plied the waters from New York City to Kingston, NY, between 1861 and 1917, at which point she was retired, and sadly sold for scrap in 1920. None of the Day Line ships were preserved, a true crime in my opinion. Kingston is about an hour away by car but is not very far at all, really. It just takes that long because it requires a convoluted route to get there. I live on the other side of the Hudson, and it's pretty much in walking distance from my home- or would be if the topography would allow. (not to mention my health, which makes walking a challenge sometimes). Or if it wouldn't require crossing the train tracks. I don't know if any sidewheel paddle ships survive, if they do I know they are not in service anywhere. The aforementioned Minne-Ha-Ha is one of I believe only three ships in the entire US that still gets her motivation from a paddle, hers is at the stern (I think that's the right terminology- it's at the back). As far as I know there is not a single ship still powered by a walking beam engine, shown here over the side paddle. So much has been lost. Thankfully, the cards survive. The water damage shown on this card is not actually on the card itself. The painting, which is not dated on the card but I believe dates to about 1890, that has the water damage that the card faithfully replicates. The American Heritage Steamboat issue has several local ships in it. The Hudson had steamboat routes on it for generations, starting in the early 1800s, up until the 1970s. One of the ships in the set, which did not ply the Hudson, survives on land as part of a museum in Vermont. I hope to visit it some day. Now we get to a string showing a favorite by decade. This is going to be tough because I will have a hard time picking a favorite from each decade. I'm writing up all 30 of these posts at one time so the card chosen at the time of writing and the card I'm thinking at the time of publication may be totally different, but I'll stick with whatever I originally pick. I've shown this card before, but I love it so much, I had to show it again. Click the link of you want to see the last time I posted it, which also shows the card back and some actual photos of this vehicle. This one's easy- how about a card of an actual family member? Kevin Love is my 21st Cousin, 3 Times removed. It's a very distant relationship, but we are blood relatives. (we both directly descend from a guy who lived in the 1300s). I have not actually met him, and probably never will, but still family. This is from 2016-17 Donruss and shows the Christmas Day jersey from the 2015-16 season. I got this card one year to the day that the photo on it was taken. Also, this card came from a box my Mom gave me for Christmas 2016. A very large portion of my collection has been gifts from family members so I could have chosen thousands of cards, to be honest. Before I get into today's post, a thanks to Chris aka The Collector. Got the package today! I'll have a proper post up as soon as I can, but likely in a few days. Luckily, I have all 30 of these Challenge posts written and ready to go so I just had to add this message to the front of one. This is a tough one. Most of my card collection I bought in person- the majority of my collection was purchased between 1996-2006, before I even had an Ebay account, so most of my cards were purchased in person. And the story is pretty much the same for all of them- I didn't have it, so I fixed that problem. That's pretty much the story of roughly half my collection, LOL. The other half being cards I received as gifts or in trade. 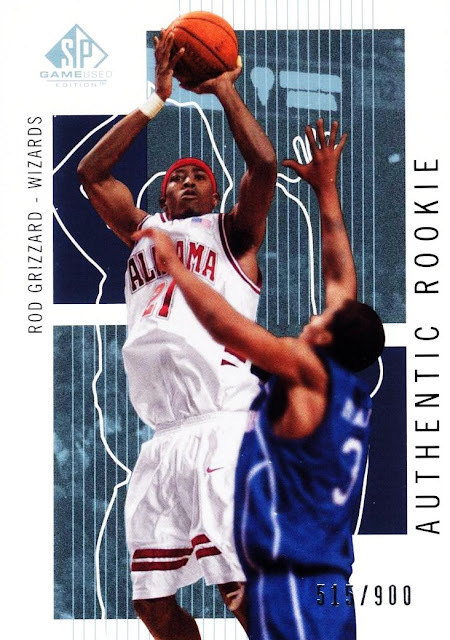 Choosing one that has some sort of meaning other than "I saw it, didn't have it, wanted it, could afford it" is a challenge, but again I will dip into my NBA pool and show a card I have shown before. 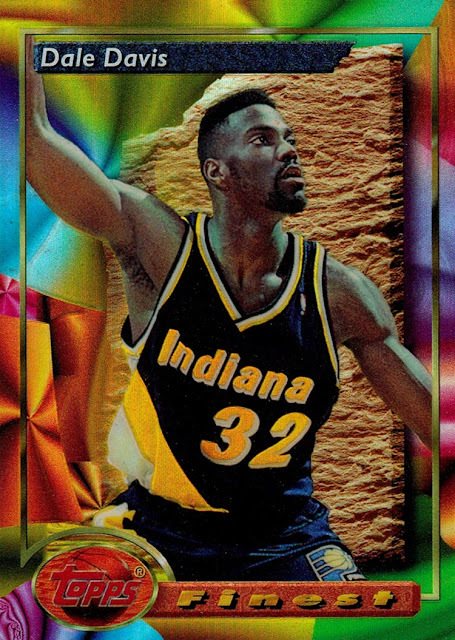 The majority of my collection is NBA, so these posts have been trending more to the NBA, and this is a card that does have some added meaning to my NBA collection Wait, let me correct that. This is a card that has added meaning to my collection, but it's not an NBA card. 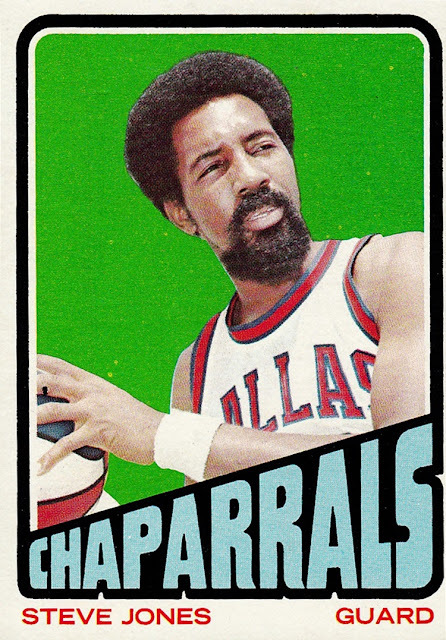 Instead, I will show my first ABA card! I don't remember when I got this card...but I remember where. The Baseball Card Shoppe in Fishkill, NY, which is where I sourced my first 1970s cards from. It closed in either December 1996 or January 1997. But I must have gotten it earlier in the year because 1996 was a peak time for card shows, so for this to be my first it had to have been in either February or March- April at the latest. I began collecting the NBA in February, and the card show season started in March, which is how I'm figuring this. Unfortunately, I didn't begin to keep track of when I got any cards until right around Christmas 1998, so the exact date is lost. The fact that we went to the store every week eliminates any chance at guessing. Who would have guessed this would be the longest post in the series so far? I'm a notable cheapskate. I don't like to spend a lot of money for stuff. I try to keep single card purchases these days to under $5. I recently had to be talked into dropping $15 on a card on COMC by my mom and brother. Granted, I don't have as much to spend as I once did, what with having to pay for the medicine that keeps me alive. A $20 bill is pretty much my monthly hobby budget these days, sometimes, if I am lucky, half of my month budget. But there was a time when I would spend more than that on a single card. In fact, twice in my life, I've gone into triple digits on a single card. This was the first time I did so. 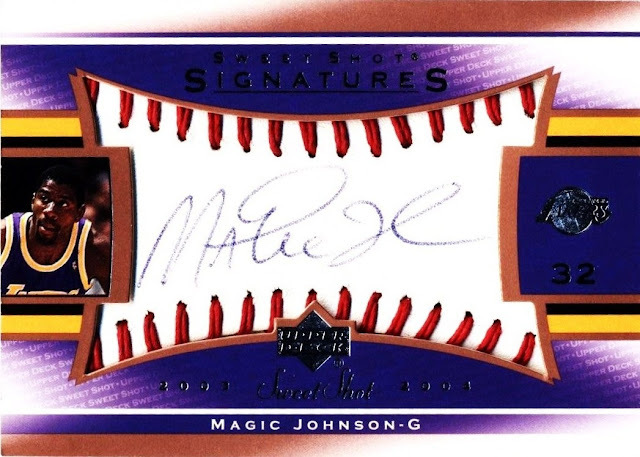 From 2003-04 Upper Deck Sweet Shot...it's Magic Johnson's autograph...on a baseball for some reason. (simulated, I believe). 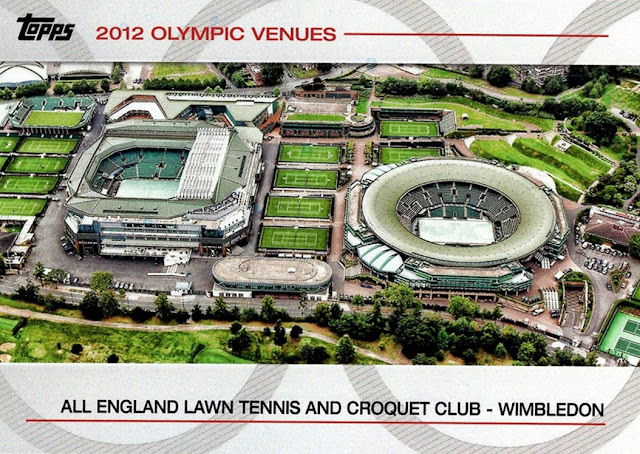 This scan is not very good- it's set back deep in the card so it doesn't look right. I spent $200 for this card...I set up a payment plan with my local dealer and paid in installments. I kind of regret spending that money on a single card, but I also know now that if I had not done it back then, there is no way I would ever be able to get it, because I can't do that now, even if I wanted to. Even if I could, I'm not sure mentally I could convince myself to...I do wonder sometimes what it might be like to be able to afford the rare cards, but I try not to let myself go there. Just in posting this I was thinking to myself what I could do with $200 on COMC or Ebay right now...how many cards I could get to fill holes in my collection(s). But it's really a fool's errand to think of that because I won't ever be able to do it, so why get all my hopes up, you know? 30 Day Challenge 5: A certified autograph of a favorite player. 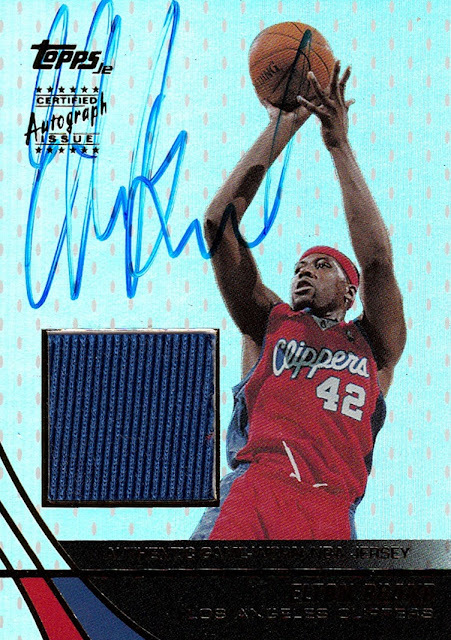 I mentioned in the last post in this series that would see Elton Brand during the project. That time is now! From 2003-04 Topps Jersey Edition, this is actually the base version. Elton is one of only a few people in the set who had autographed base cards, while most people had just jersey. Elton was a Topps spokesman at the time. I was never able to pull an autograph of Elton. I did boxes of every single Topps set from 1999-00 through 2005-06, and he also signed for Fleer, which I opened all but one of their boxes during the same time period. (I somehow missed 2000-01 Fleer Focus). Never pulled his autograph...I pulled hundreds of autographs in my life. But never his...wish I had. My mom gave me this one to celebrate my not dying a few years ago. Every year she gives me a present, and one year it was a box of Elton autographs and relics. This one looks a lot better in hand than it does in the scan- it's all Refractory holofoil. I bet you expected to see Elton Brand here! Yeah, that was my first thought to- I've got almost all of Elton's rookies so I could easily post 10 of them. But...I won't. You will see Elton during this project, but not today. Instead, I am going to put the spotlight on a favorite player still in the NBA. Draymond Green was drafted 35th (!) by the Warriors in 2012. Draymond is outspoken, never shy to give his opinion on anything, and also one heck of a player. 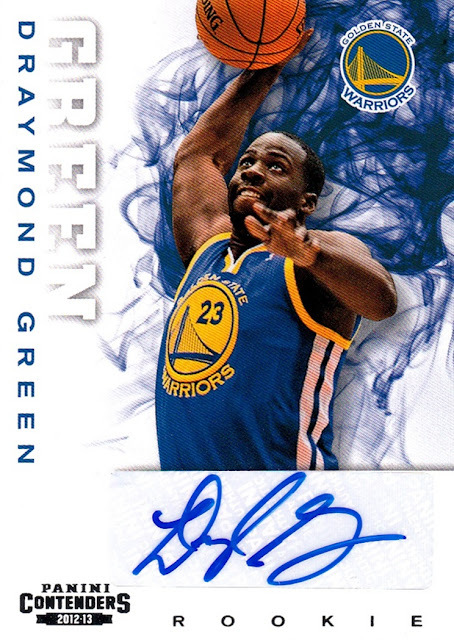 When I get my rear in gear and post my "Second Round Steals" series, you will see Draymond featured prominently. He's unlike most of my favorite players...I tend to favor the guys who don't make waves, just come in, do their job, and do it well. (See: Elton Brand, Tim Duncan, etc). He's just got a charisma that draws you in, I suppose. The Warriors would not have won the 2014-15 NBA Championship without him, and they lost the 2015-16 Championship partially because they had to play without him. I got extremely lucky and pulled this card from one of those Wal-Mart repacks that had 4 packs of 2012-13 Contenders in it. I got every one my Wal-Mart had and I still have one left I have not opened yet. Soon! (I think they only had 5 of them) I doubt I will be lucky enough to pull anything as amazing as this card, though. I actually just wrote about this topic about a week ago in the Blog Bat Around, when I wrote about the hardest set to complete. 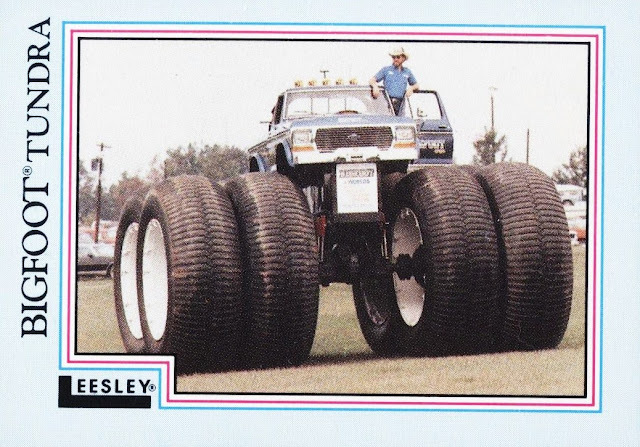 It's actually the very same set, the first card set I ever got, 1988 Leesley Bigfoot, that I have been working on since 1988! Still 9 cards short. This is going to be a really short post because I just wrote about it on my own before this 30 Day Challenge began. But the least I can do is show a different card from the set than I showed then. For the second day of the challenge, the concept was a card with more than one person on it. That's a pretty wide variety of subject matter. Does it mean a card set up to be more than one person? Or one made for one specific person that other people appear on prominently? A team card? A League Leaders card? A lot of options! However, I knew instantly when I read the chart what card I was going to showcase. 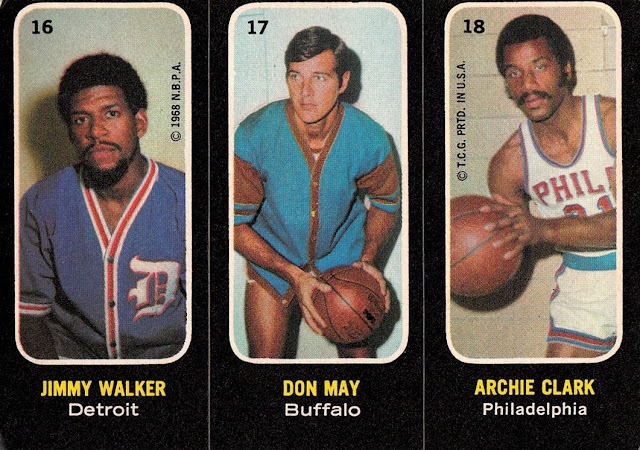 My first Trio Sticker insert from 1971-72 Topps. 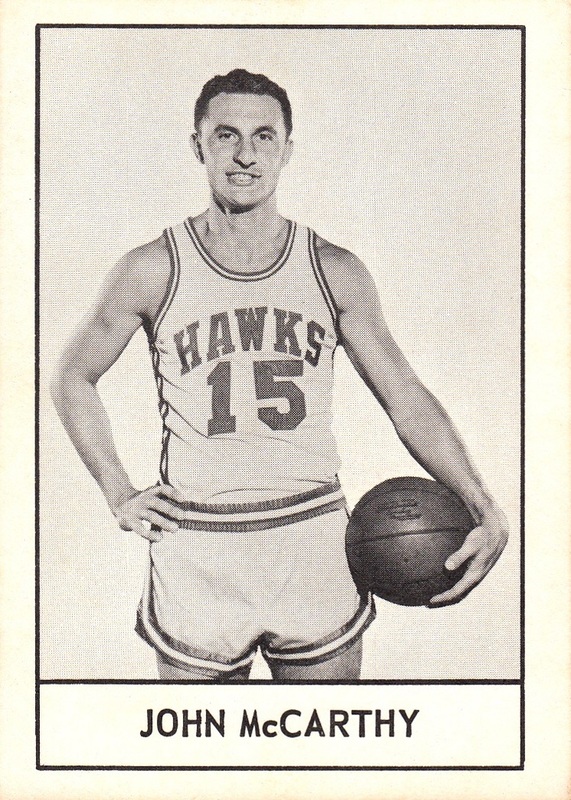 This was the first standard size insert card in NBA history. I got this one a card show sometime in the 1990s and when I got it I didn't even know what it was. I knew it was old based on the players but it would be several years before I learned what it actually was. I don't actually remember that story of how I found out. But from whenever I got it in the 1990s until late 2016 it was my only card from the set. I detailed the new additions to the set I got in late October in this post. It was not the first insert in NBA history. 1969-70 Topps had fold-out rulers, which I don't have in my collection, and 1970-71 Topps had posters, which also came folded. I do have one of those- Willis Reed- but the paper is very brittle. I don't like to handle it much for fear of damaging it. Topps used newsprint for it, but not good newsprint. They probably didn't think there would be anyone trying to collect it more than 40 years later, but there are. I show a scan of my poster in my all-time most popular post, my New York Knicks Uniform History. OK, I'm not the kind of person that you'd normally describe as "jolly"...most often I'd say a more fitting word would be morose. But hey, when you get some cards from a gifting program called Tis the Season, what other post title is possible? Jedi Jeff had a program called Tis the Season around Christmas time (naturally) and some life got in the way, but he hit up my PO Box with a package of cards that did, indeed, bring a smile to me. There was some NASCAR but the majority of the package was Olympic cards. 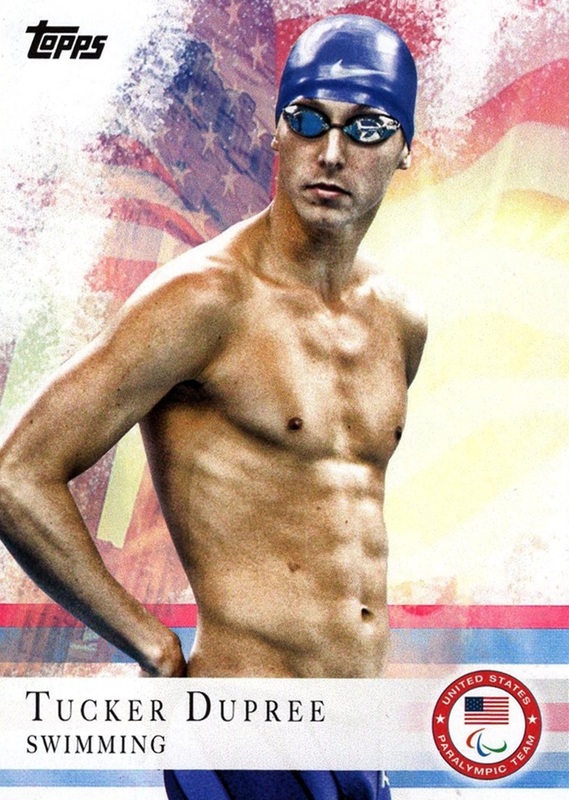 As you know, I am a huge Olympics fan. I've completed the 2014 and 2016 sets, as I did boxes of both of them. But I had not completed the 2012 set, which was the first Modern Topps Olympic set. I did not do a box of the set, so it remained incomplete. That..is not something I can say anymore, as the cards from Jeff completed the set! I even discovered two cards that may be unreported variations. The scans of two of the cards on the Trading Card Database showed the Olympic rings, but my copies show the Paralympic logo. 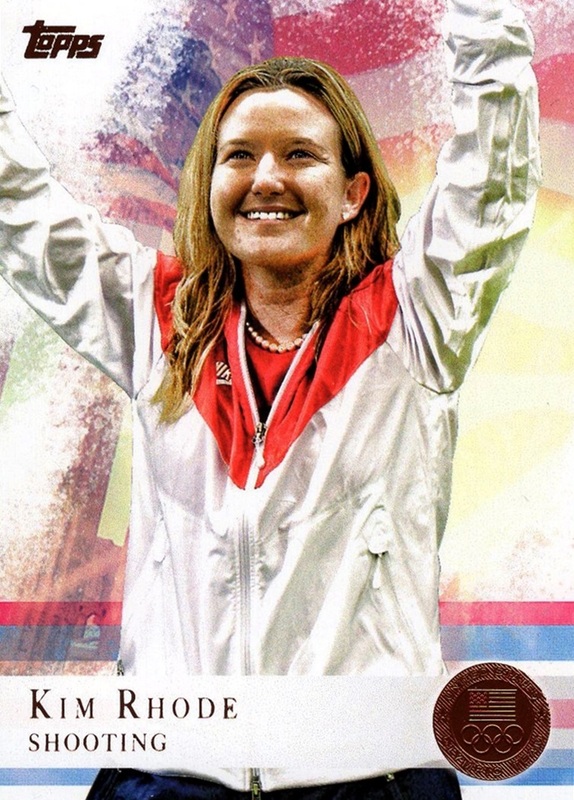 I soon discovered that my Kari LaRaine Miller card also had the Paralympic logo. Here's a card with the Olympic rings for comparison. 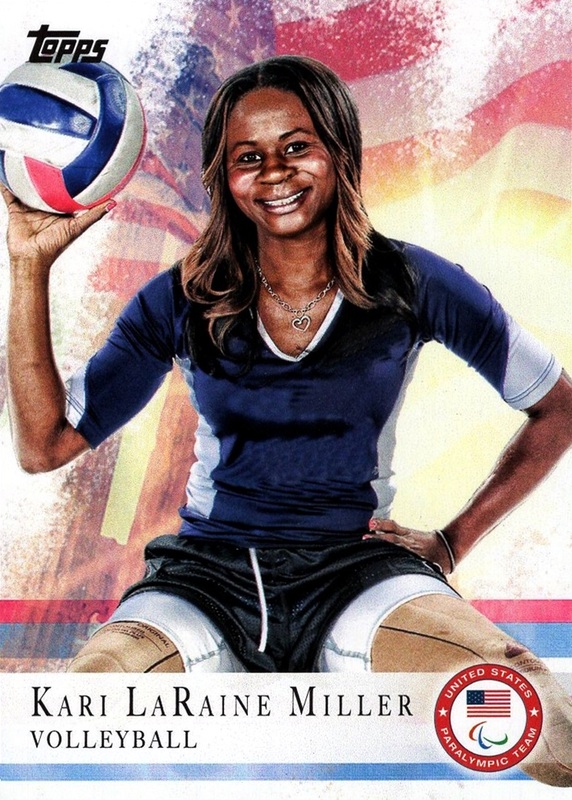 I need to get out my collection of the set I got when new and check the other Paralympians. Unfortunately Topps messed with the photos of every single card. But being literally the only option, we just have to accept it. There were examples of all three parallels, as well- Gold, Silver and Bronze. Bronze is the most common, but Gold and Silver seem to be about equally common to each other. That's Bronze, Gold and Silver, in order. Some inserts were represented too, but this set was not big on inserts and I only scanned one of them. The big deal, though, is that I completed the base set, which means that I have now completed all 4 Topps Olympic sets, counting the 1983 set which I have complete but don't count as part of my collection yet- I have not looked at all the cards, so they don't count until I do- so hopefully it actually IS complete. I do have a horrible track record of buying a hand collated set and missing cards. For $5 I felt it was worth the risk. 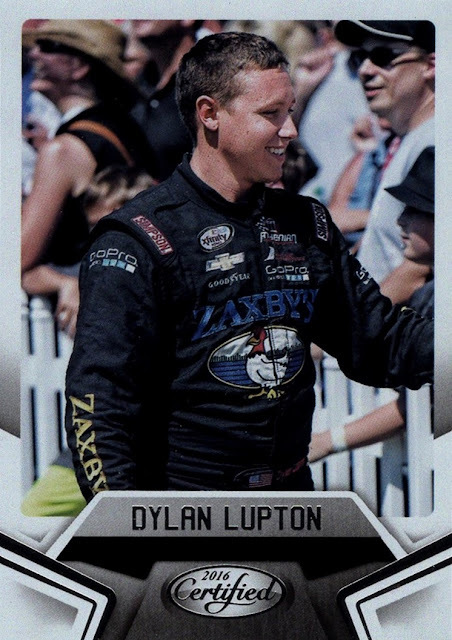 That's my first card of Lupton and my second card of John Hunter Nemechek and Nicole Behar. In fact my one and only blaster, I pulled her autograph as my hit, and I am always happy to add cards from Winston West and Busch North, or whatever they call them now. 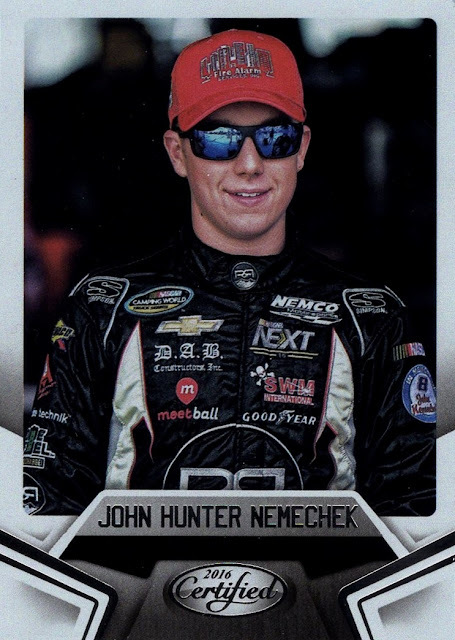 I remember when John Hunter Nemechek was born...he was named after his uncle who was the first person to be killed in Truck series history, John Hunter was born just months later, in 1997. You may recall last year I was quite surprised to find out that John had gotten a card of his own in 1996 and I wasn't aware of it, until I got it. There were some Cup guys too but I would rather focus on the up and coming drivers here. There were also some cards from 2016 Prizm, and 2008 Stealth Retail. That's not a set I have a lot of, while the Prizm set I've completed and was able to get one new Prizm parallel from this shipment. Here's an example of the 2008 Stealth Retail. 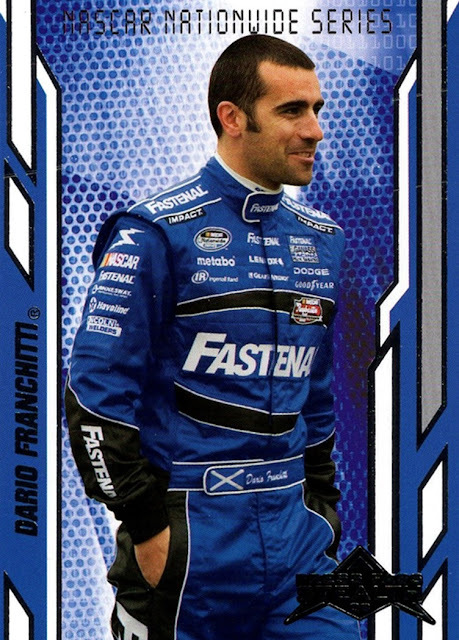 Dario Franchitti is one of a long, long list of open wheel drivers who could not figure out how to handle a car in NASCAR. I'm a fan of his, and was before his half-year attempt at NASCAR, but it did not work well for him. 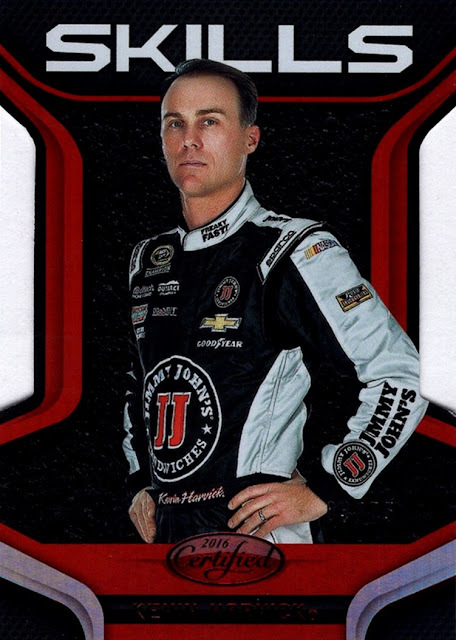 He broke his foot in a wreck and never came back; he ran for Cup Rookie of the Year in 2008. I was hoping he would be more successful than he was, but it was not to be. I believe he suffered a career-ending back injury when he returned to the IndyCar series, which is unfortunate, but it may have been a different driver. I don't keep up with Indy as much as I would like, and to be honest I'm losing some of the NASCAR knowledge I once had, too. Thanks for the great package of cards, Jeff! Some great stuff here, and I'm thrilled to have all of it. 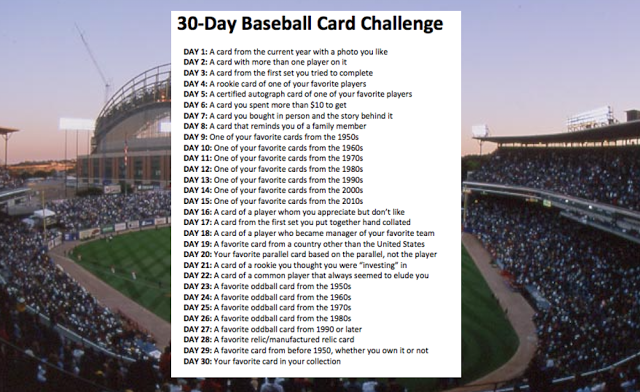 Recently Tony at Off Hiatus Baseball put forth the concept of a 30 day baseball card challenge. It's a great idea, and I originally said in a comment on his blog that I would be condensing it down because I have other stuff I want to post as well. But then I reconsidered....nobody said it had to be 30 consecutive posts so I decided I would go all-in. But...I'm not a baseball guy. Sure, I have baseball cards. You can't be a card collector as long as I have been and not accumulate some. But I don't have enough to do this project. What I'm going to do is tailor it to suit my needs. I'll use Tony's 30 days, but it will be my collection that provides the scans- you will see NBA, you will probably see NASCAR and NHL, and you will definitely see non-sports cards. I have not planned much beyond post #1 yet so I don't know what all will show up, for the most part. I don't plan to repost it every post so memorize it, save it to your computer, or bookmark this post for future reference, LOL. Or better yet, write your own series! Some of these are going to be tough. Not because I don't have anything to choose from, but because I have too much to choose from! How do I pick a favorite card out of more than 140,000 options? I'm sure I'll come up with something. But #1, is A card from the current year with a photo you like. 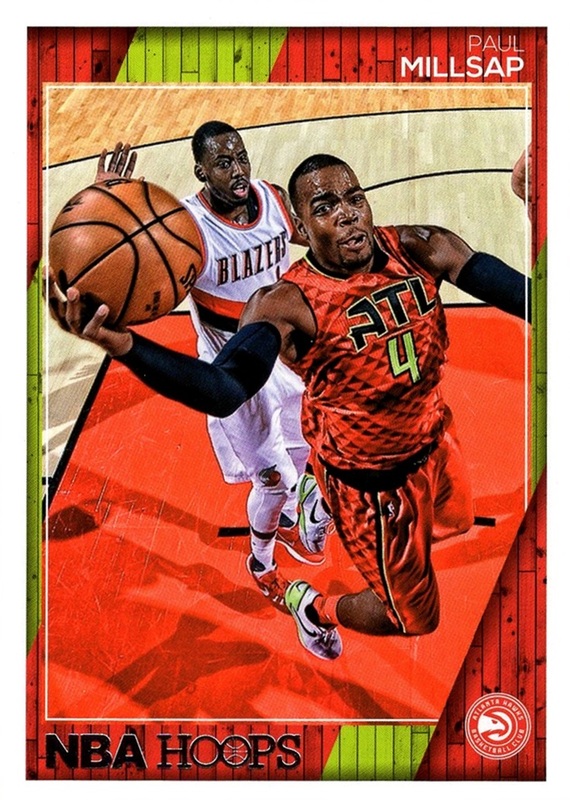 I have chosen 2016-17 Hoops #40, Paul Millsap of the Atlanta Hawks. My fondness for through the glass (backboard) shots has been previously documented, and the look on both player's faces is fun. Millsap seems to know what a cool shot this is going to be, and the Blazers player, who I think is Al-Farouq Aminu, seems to be throwing up his hands knowing he won't be able to block this shot. The fact that it shows the alternate red Hawks jersey is just an added bonus.The Hawks jersey number and the trim is neon yellow...doesn't really show in photos or scans very well.